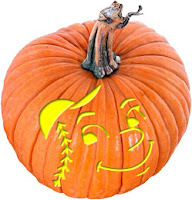 Just in time for Halloween 2010, the Mets shared a link for fans to .gif and .pdf files with stencil images for carving pumpkins. Here's the link to the fan page. I didn't get a chance to carve a pumpkin, but thought I could use the designs to create one in fabric, using the stencil images to create appliques or perhaps to digitize them for machine embroidery.